‘David Wojnarowicz: History Keeps Me Awake At Night’ at the Whitney Museum of American Art | The Bottom Line "The Drawing Center"
Currently on view at the Whitney Museum of American Art, David Wojnarowicz: History Keeps Me Awake at Night is an exclusive look at the progression of the artist’s career during the late 1970s and 1980s. David Wojnarowicz (1954–1992), a self-taught queer artist, created work reflecting his emotional response to Western social norms, mortality, and human rights. Over the two decades covered in this exhibition, Wojnarowicz made paintings, poems, sculptures, and videos that reinforced his passion for those who are consistently misrepresented and explored the United States and its monetary goals in the era. In the late 1980’s, when he was diagnosed as HIV-positive, Wojnarowicz became an advocate for artists and others affected by the virus. David Wojnarowicz: History Keeps Me Awake at Night expresses deep discontentment with the injustices the artist experienced in the United States, while also revealing the most sensitive moments of his life. Wojnarowicz’s self-portraiture incorporates immediately recognizable reflection about the artist in relation to society. 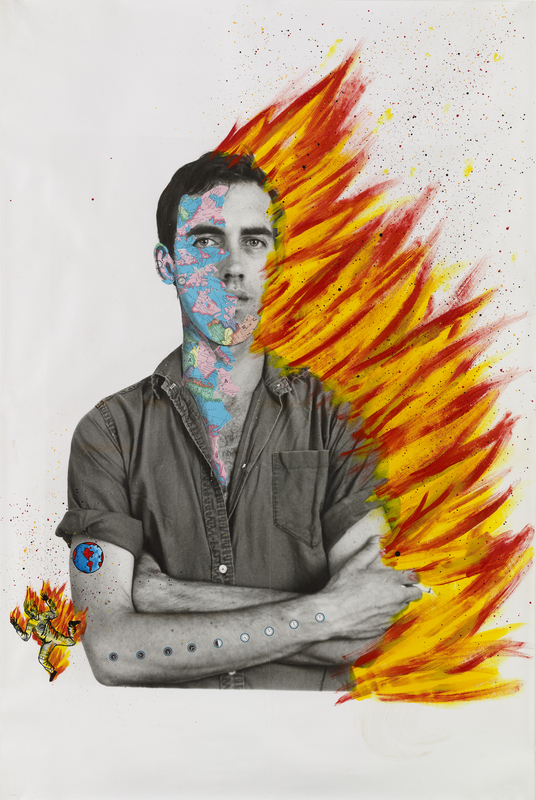 In the painting created by David Wojnarowicz with Tom Warren, Self-Portrait of David Wojnarowicz, 1983–84, the viewer confronts a photograph of the artist with a topographical map collaged onto one side of his body and fire to the other. A small burning man, made out of a dollar bill, with an image of a clock on his chest also appears in the work. References to global experience paired with the artist’s honest expression in this map-overlaid portrait suggest that Wojnarowicz is a symbol for humanity. The flames on the opposite side of his face, meanwhile, seek to oust his passion for the world and for humanity. By analyzing Wojnarowicz’s body language in this portrait, one can further determine his intentions. The artist is represented with arms crossed, communicating his disappointment, and is completely unbothered by the flames that try to consume him, his gaze connecting with and challenging the viewer in a stare. Wojnarowicz transformed ordinary materials, from maps and money to bread and string, into works of art during his career in the 1980s. Early in the decade, he was also a member of a band called 3 Teens Kill 4, for which he made posters. In these posters and other works from the same period, he recombined and reinvented symbols, creating a visual iconography that drew a relationship between the past and the present. In Diptych II, 1982, located in Gallery 2 of this exhibition, the artist used stencils of airplanes, targets, a male figure dreaming, and a burning house over the outline of the United States. He juxtaposed these images with another painting of a man falling from the sky near a row of black and white houses, set against orange and yellow colors that resemble a sunset. A target is placed between the diptych and a figure stands on either side. Wojnarowicz used these recognizable symbols to associate the United States with mortality and war tactics. The painting also suggests an unstable family or living situation and war in more than one place, on the battlefield and at home. In work such as Untitled (One day this kid . . .), 1990–91, David Wojnarowicz has an uncanny way of expressing the societal issues happening around him. 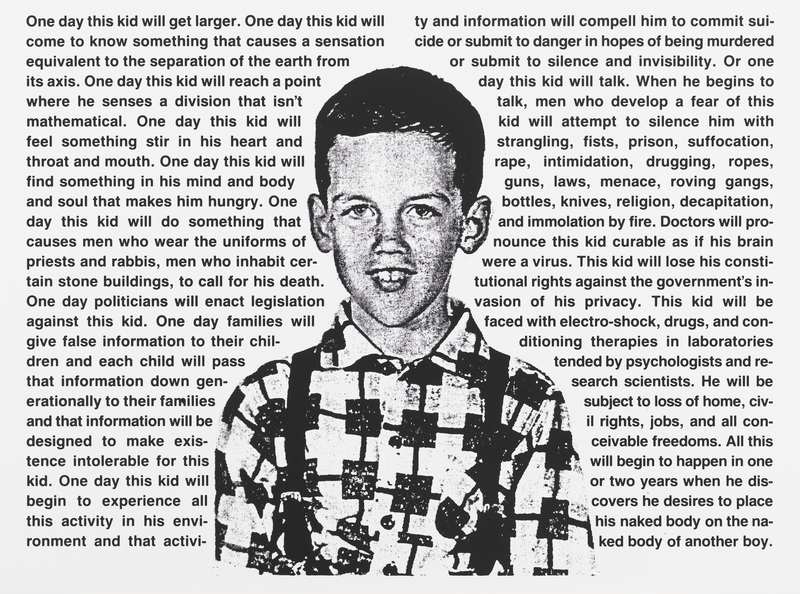 In this work, Wojnarowicz uses a photo of himself as a child to allude to the purity, excitement and innocence that children have about the world. He was once a child, soon to face the adversities of the world, and he expresses his thoughts on this pivotal moment by juxtaposing words and imagery. The words surrounding his childhood photo communicate the danger and institutional oppression he would face throughout his life in response to his sexuality. His work not only exposes injustice but is the evidence of the faith he had in people to shape the world. By revealing and exploring such issues, Wojnarowicz’s work sustained his hope for a better world. The art of David Wojnarowicz forces the viewer to confront societal and political hang ups about homosexuality and human rights, revealing how deceptive the world can truly be. Wojnarowicz created dynamic works of art to encourage citizens, including those who have been marginalized by society, to engage with and understand social responsibility through art. The realities that Wojnarowicz was confronted with in life were harsh and brutal, but by illuminating and sharing these issues openly with the world, his work makes room for further conversations about inclusion and respect for others. 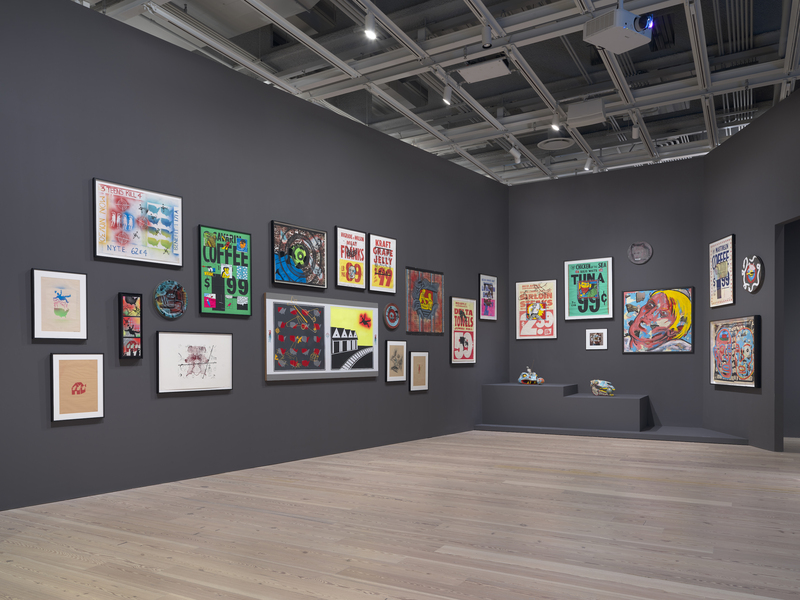 ‘David Wojnarowicz: History Keeps Me Awake At Night’ is co-curated by David Kiehl, Curator Emeritus, and David Breslin, DeMartini Family Curator and Director of the Collection. The exhibition is on view through September 30.